If you have never seen Hitchcock’s Vertigo (1958) – and I suppose there must still be a few people out there who haven’t – my advice would be to watch it before you see director Guy Maddin’s The Green Fog. 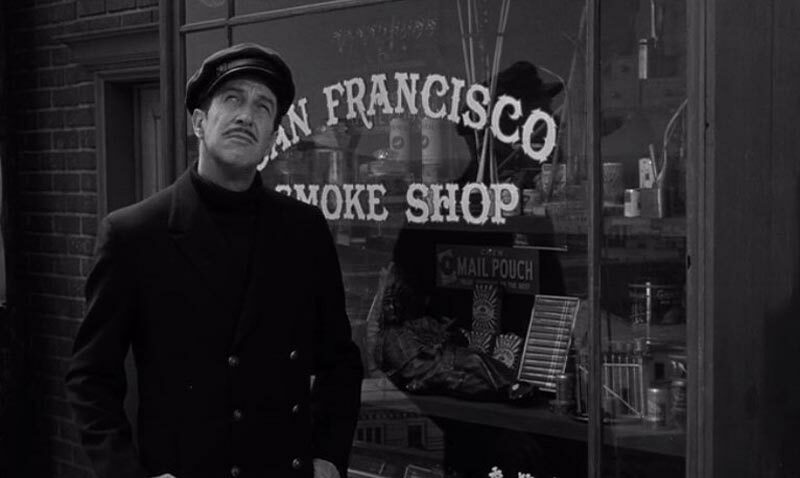 In his homage to Hitchcock’s ultimate psychological thriller as well as America’s ‘Golden City’, San Francisco, Maddin has attempted to reimagine Vertigo through a series of spliced together clips of the city as depicted in other films. There are two ways to watch this film, one which works better than the other. If you know the story of Vertigo it is interesting to see where it’s most famous sequences are captured here – the opening rooftop chase and later suicide jump from the church tower are two which are more recognisable. However apart from the most obvious scenes, the other attempts at recreation in fact end up being to the film’s detriment. As it is heralded as one of the main reasons behind the work, fans of the original will likely spend most of their time trying to spot the references to Vertigo. However, as many of these are so oblique as to be almost non-existent, you may well find you’ve been so busy trying to spot something which isn’t there, that you’ve missed all the real fun. Which is seeing how many of the iconic films and TV shows (and their stars) that Maddin has featured, that you can name. Of course there are the obvious such as Vertigo itself, along with Mrs Doubtfire (1993) and Pacific Heights (1990). But how many people would recognise the classic noir Sudden Fear (1952) featuring Joan Crawford in an Oscar nominated role, or Deborah Adair from TV’s Dynasty as she appeared in the San Francisco based series Hotel? You then have appearances by everyone from Vincent Price and John Saxon to Meg Ryan and Melanie Griffith. The film is shot through with a deep vein of the trademark quickness of Maddin, the director behind such oddities as the bizarre short film The Little Cloud That Cried (2009) and award winning The Forbidden Room (2015). Here there is virtually no dialogue, save for the occasional obscure interjection by numerous characters as they pass through the action. Instead the various film clips speak for themselves, forming a storyline the fog shrouded opaqueness of which one can’t help but feel was intentional. The best way to approach The Green Fog is to sit back and let it roll over you, becoming lost in its mesmerising portrayal of one of the most beautiful and exciting cities on earth. Just don’t search too deeply and ask what’s really going on, as by the end you probably won’t have any clearer idea than when you started.